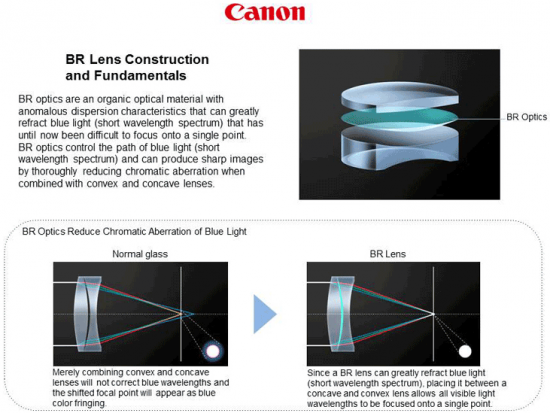 Canon has developed Blue Spectrum Refractive (BR), a new optical element for use in camera lenses that corrects chromatic aberrations at an extremely high level to achieve superb imaging performance. Canon develops optical elements by reviewing organic optical materials, beginning with the design of molecular structures, with the aim of achieving optimal chromatic aberration correction that suppresses color fringing. With the successful development of the BR optical element, which offers unique light-dispersion characteristics that significantly refract blue light-a wavelength that, until now, had proven particularly difficult to converge to a specific focal point-Canon is able to develop lenses that result in outstanding imaging performance by correcting chromatic aberrations at an exceptionally high level. This entry was posted in Canon and tagged Canon EF 35mm f/1.4L II USM. Bookmark the permalink. Trackbacks are closed, but you can post a comment.